So GH has really been great hot soap opera these last two months, hasn’t it? From the September day the show changed time slots, headwriter Ron Carlivati has been expertly writing storyline crescendos or setting off story exciting climaxes week after week. First there was the waterside remote with the explosion, then Sonny and Kate’s almost wedding, and this week the Lavery return with Heather’s return to Port Charles and the kidnapping the baby. Next week, we have the beginning of the end (death?) of Jason. GH seems committed to trying to save itself through this continuous level of excitement and unrelenting storyline tension. You really have to hand it to Carlivati, Frank Valentini and all the show’s cast for giving the show all they’ve got. GH certainly does deserve its impressively climbing ratings of late. The Bold and Beautiful: B&B brought a real tear to my eye this week when Stephanie’s oncologist told her that her cancer was back, and this time there was no hope. What will B&B — and all of daytime TV – be like without that singular acting phenomenon known as Susan Flannery? No one plays the expression of absolute truth better or more movingly. Flannery is retiring from B&B in December after 25 years. That Steph’s death couldn’t have been kept a secret for the sake of suspense is too bad. But I’m sure Flannery’s acting when Steph tells her family and friends (in special episodes over the next two weeks) that the cancer is terminal will bring many more tears to us longtime B&B viewers. I’m counting on you, headwriter Bradley Bell, to make the scripts of these disclosure scenes truthful and not full of treacle. Flannery has never played a false note in all her years in daytime (which before B&B encompassed many fine years as the original Dr. Laura Horton on Days of Our Lives.) Get out your boxes of tissues, B&B fans! I like how RC pays tribute to ABC’s old soaps. Heather mentioned Pine Valley and Corinth as possible places to hide. Luke and Anna mentioned her old husband David Hayward. Sam and John talked about knowing each other from somewhere, referring to Lizzie and Caleb of Port Charles. And of course, all the characters from Llanview in GH. In this way, GH is keeping alive ABC’s old soaps. I am loving GH! The Duke/Anna scenes were worth the 23 year wait! And how nice it is to actually not be super nervous about how the writing will go for a returning GH vet. Duke seems to be in character. What a difference a new head writer makes! Thank you GH! I may be in the minority with my hatred of Duke, but I’m really not feeling this guy. In fact, he’s way too creepy for me. (I wasn’t watching back when Duke was on, so I have no history there. I only know Ian Buchanan from his short stints on AMC and DOOL…neither of which characters I liked.) Not to say the scene with Anna and Duke wasn’t excellent, acting-wise, but the way they are re-introducing Duke is NOT going over well with me or causing me to like him. The first time we see him he’s holding Robin “hostage?” And he’s watching Anna suffer as she’s searching for Robin? And then asking Anna how Robin is when he sees her? Now he’s involved with Joe Jr.? What? It seems to me that Duke is an evil character, not some great “romantic, love-of-my-life” character who’s come back for Anna. I hope she finds out soon that this guy is up to no good and she kicks him where it hurts. Marlena says: I’m sure viewers who haven’t seen Duke before don’t like him. Why is he holding “dead” Robin hostage while making goo goo eyes at her mother? The writers are going to have to come up with some fancy explanation for this! Will they turn Duke (who is kind of evil looking, I admit) into a really bad guy permanently? Again, this is up to the writers and should all be explained before too long, I hope! I think Luke and Duke (their names rhyme!) make great adversaries as they fight for Anna’s love in the dynamic acting team of Tony Geary and Ian Buchanan. Forgot to mention Heather…I love Robin Mattson and no one plays evil, crazy better than her. But I’m SOOO ready for her to be gone. I don’t want her dead…it would be OK to have her come back every few years to stir up a little trouble…but she’s at the point where she’s out-lasted her welcome this time around. When babies are used as pawns, it goes over the line for me. It’s bad enough that the show killed off Starr’s child and Tea’s baby in the last few months. To have a baby held hostage by an insane woman is too much. Marlena says: Oh SZima, anything goes in today’s soap world, even the threat of throwing babies off rooftops! And since story stakes have to be held high to fortify ratings, I think that daring, sometimes offensive story turns will only increase in the future. I am so enjoying GENERAL HOSPITAL these days, the dialogue, the humor and the wacky story lines. 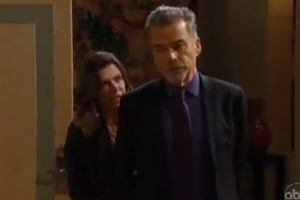 But I find the return of characters like Duke or even the Llanview characters jarring to say the least. What if a viewer isn’t familiar with Blair, Todd or Tea and then they pop up emoting about their overwrought issues, totally perplexing those who are not acquainted with them or their back story. Todd has been a wonderful addition to GH. I’m not that crazy about Starr. I found her more interesting when she was a little girl, a spoiled bratzilla on ONE LIFE TO LIVE, but she is Todd’s daughter, so that counts for something. I’d like to see Jack Manning, Todd’s son pop up in Port Charles, stirring up trouble. Thanks for another great column. I’m so loving having you back on a weekly basis! GH has been must-see TV in the past month since moving to the earlier time slot. What a joy it is to be able to say that about a soap these days. Ron and Frank are doing such a stellar job revitalizing this show. So glad you are also acknowledging that after being so critical of them at OLTL. Their turning GH around so quickly just shows what can happen when you have the right headwriter and EP in place AND the network isn’t interfering with what they do. Marlena says: Hi James and thanks! Marlena is so grateful for her longtime readers. Frank and Ron have stopped all that sexist stuff they overdid at OLTL, which was my main objection to their work. Without it, their work certainly does shine on GH. I’ve never been a big B&B fan, and what little I’ve usually watched was principally because of Susan Flannery. But wow, B&B has been FLAWLESS in telling Stephanie’s story. FINALLY, we may just get a character departure that is as fulfilling at the end as when the character arrived. That is incredibly rare. Marlena says: They certainly are doing a good job with these Stephanie tribute episodes. Love, love, love the flashbacks. I welled up when Stephanie told Brooke she was going to die and Susan Flannery and Katherine Kelly Lang did a marvelous job! A key reason for my appreciation for Flannery—who has three of her four career Emmys in the role of “B&B’s” Stephanie Forrester—is the keen, psychological understanding she has with this character. Not showing a false note means the actress knows [Stephanie] thoroughly. This goes back to when the series launched in March 1987. (Her 1966–1975 run on “Days of Our Lives,” for which she won the 1975 Emmy for best actress, came before the beginning of soap-opera following.) Whatever subtleties, whatever variations, whatever twists have had to become incorporated into her characterizations, to make for a proper enough fit to accommodate storytelling, Flannery has always come through. It’s a big part of what is required of an actor portraying one character for years, even decades, on one given series. I really want to see “B&B” bring to the forefront a new female leading character over the age of 50 who can blend in, quite convincingly, with Forrester Fashions. (I’m thinking as well for how to handle the Eric Forrester character, played by John McCook, for enhancing future storytelling.) One who helps the show make up for a loss that was going to be inevitable. (Flannery’s upcoming departure was at least two years in the making.) And to ultimately keep this show not just afloat … but to acturally thrive. I am happy for Susan Flannery’s announcement of wanting to leave because of retirement. She has been a professional actress since the 1960s. (Flannery won a 1974 Golden Globe for “The Towering Inferno.”) She has worked a long time. (My father, now 80, has been retired 15 years. That means a lot!) Whatever personally is a need and/or a want of hers … that means so much. I will miss her presence. But it’s very understandable. She deserves her own time. So I wish very well for Susan Flannery.